“I first met Thomas at the very end of the 20th century. The attraction was instant and when I parted from him in London I felt physically sick.” Thus begins Jenny Balfour-Paul’s book on her personal journey in the footsteps of Victorian adventurer Thomas Machell from India to Patagonia, from Polynesia to Afghanistan. Machell, a midshipman and indigo-planter in the merchant navy, exhaustively chronicled (five volumes of journals) his travels. Balfour-Paul came across his journals in 1999 while attending a meeting at the British Library. A librarian pointed them out to her, and thus started an obsession that lasted more than a decade. Machell had travelled on an Arab ship dressed as an Arab. Balfour-Paul was taken aback at how much they had in common. Machell had travelled to Arabia, North Africa, China and the Indian subcontinent — the routes she also followed while researching about indigo, a subject in which she is internationally renowned. “Deeper Than Indigo” is a deeply descriptive, colourful book. It is beautifully illustrated with Machell’s own drawings taken from his journals, which are full of evocative, and sometimes funny, sketches and watercolours. Machell’s accounts are interwoven with Balfour-Paul’s — her trips to India as a teenager, her marriage and her global travels in pursuit of Machell, and so are the illustrations — she has added her own to those of her hero. She has been to West Bengal several times. In 2010, she was there for a remarkable exhibit (for the first time in history) of the only surviving volumes of the Indian dye chronicler Thomas Wardle. The volumes (18 of them) were discovered in an old, dusty cupboard in Kolkata’s Botanical Survey of India. Around the same time, volumes of textile samples compiled by John Forbes Watson in the 19th century were also discovered. The discovery had created a sensation in the world of natural dyes. An international symposium on natural dyes was moved from Paris to Kolkata to celebrate the discovery. To get into the spirit of the era, Balfour-Paul decided to book a passage on a freighter to get to Kolkata. The Thomas Wardle set of three books with more than 3,200 swatches of natural dyed cloth at the BSI, Kolkata, is the only extant documentation of India’s dyeing tradition in the world. Although these have been digitised, it is of utmost importance that these priceless documents are properly conserved. The books contained dye samples and recipes. Wardle has collaborated with William Morris. Both Morris and Wardle wanted to document natural dye knowledge and, in the face of the growing market for synthetic colours, promote the use of natural dyes. Wardle travelled to India and collected Indian textiles, many of which were recently exhibited at the Whitworth Art Gallery in England. Along with the exhibition, there were workshops on practical applications of textile conservation and integrated pest management, and one by a team from Albert Victoria Museum on the conservation of textiles. Indigo’s history in India is tainted with memories of colonialism by the British. Bengal indigo, supposedly the best in the world, contributed to the brimming coffers of the East India Company, but at a tremendous cost to the people. They mercilessly pursued farmers to plant indigo instead of food crops. It’s been more than a century since the British left, but it is difficult to forget the stories of suffering and exploitation attached with British indigo plantations in Bengal. “Neel Darpan” was a famous 19th-century play about the revolt by tenant farmers who refused to grow indigo as a protest. It was in 1859 that the indigo revolt (or “Nilbidroha”) took place. 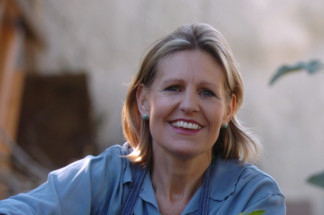 An indigo dye expert, Jenny Balfour-Paul has written three books on the subject, and lectures around the world. Her first book was “Indigo in the Arab World” (Routledge, London, 1996), which was drawn from her PhD. It is still in print (also on Kindle). Her book for the British Museum Press, “Indigo: Egyptian Mummies to Blue Jeans”, is being reprinted for the fifth time. And there’s “Deeper than Indigo: Tracing Thomas Machell, Forgotten Explorer” (Medina Publishing) which will be on Kindle this year. She was a consultant curator for the Whitworth Art Gallery’s 2007 touring exhibition “Indigo, a Blue to Dye For” and consultant for two documentary films on the subject. She is an Honorary Research Fellow at Exeter University; a Fellow of London’s Royal Geographical Society and Royal Asiatic Society and New York’s Explorers Club, and President of the UK’s Association of Guilds of Weavers, Spinners and Dyers. Indigo is the world’s only natural blue dye. It doesn’t need any mordant as its particles adhere to the fibres naturally. Jenny Balfour-Paul says what makes indigo so unique is the colour blue, the colour of our planet. “It is appreciated worldwide, but to recreate this loved colour in textiles [before the advent of synthetic dyes in the 20th century] there was only one natural blue dye and that is indigo extracted from various plant genera [not least Indigofera tinctoria].” She points out that indigo’s chemistry is unique among natural dyes, and gives the special quality still appreciated today by all wearers of blue jeans (whether dyed with plant indigo or its synthetic equivalent). Anuradha Sengupta is a writer based in Mumbai. “Deeper than Indigo” is available to purchase on Amazon and www.medinapublishing.com. The book will soon be available in the UAE.